As someone who regularly suffers from Gamer ADD, I am occasionally reminded about how many projects I have left fallow over the years. One such reminder came yesterday when Rob Conley of Bat in the Attic Games posted a set of S&W compatible rules as a prelude for a project he is working on. In contemplating all the various things I have not managed to finish, the one I am most disappointed with is my version of Averoigne and its megadungeon, the Chateau des Faussesflammes. 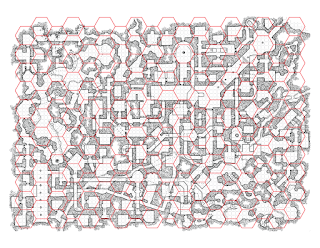 One of the reasons for this was that I ran into a problem of how to stock and handle what I envisioned as a dynamic and constantly changing dungeon. As I have mentioned many times before, historically, I am actually more of a war gamer than a role-player. Recently, I have spent more time at the gaming table playing board games than RPGs. 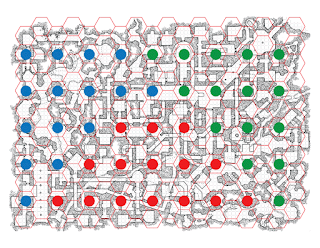 As a consequence, I was inspired to look at my version of the Chateau as if it were a board game rather than an RPG dungeon. What I came up with is a rather intriguing idea and I wanted to see if it was scalable. 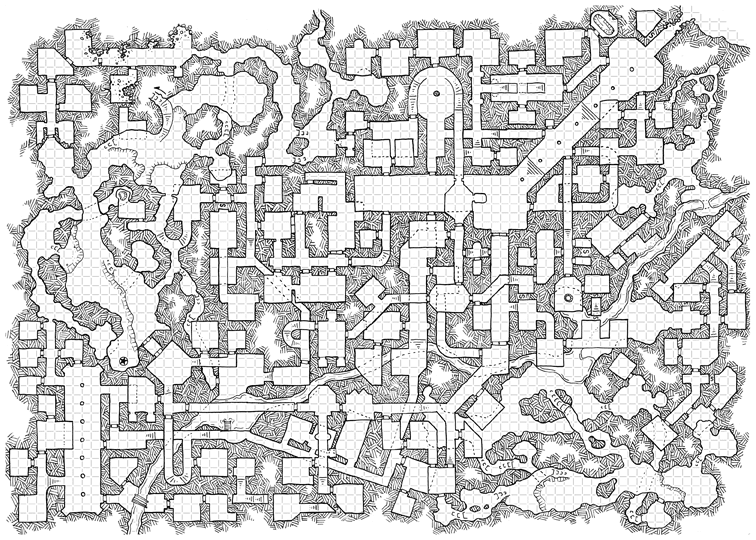 Here is my thinking: the mega-dungeon in Holmes strongly suggests the Mythic Underground that many bloggers over the years have described when re-reading older versions of D&D; however, as I mentioned in this post on Holmes on Traps, the biggest danger in this Holmesian Mythic Underground is wandering monsters. My conundrum for years has been how to marry the best ideas of classic dungeons that have factions with the Mythic Underground with the dynamism of a dungeon whose main threat is wandering monsters. My answer was to make all the monsters a kind of wandering monster by turning the dungeon into a kind of board game for the Referee. I haven't counted carefully, but I estimate that this beauty has about 150 rooms. 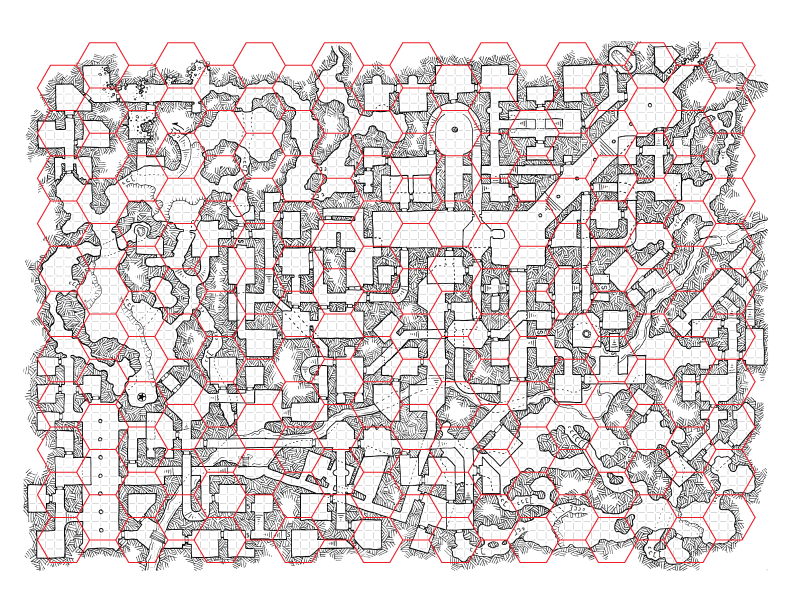 According to older iterations of the game, approximately one third of these rooms will have monster encounters or 50. When stocking a dungeon this way, one really doesn't have to stock the dungeon at all. Sure, you have to make notes about room characteristics and various kinds of traps, but there really is no need to place any monsters at all (again, unless you are married to the idea of set-piece encounters and then you only have to do up to five). What you do need is three lists of 15 monster encounters representing the three factions and a wandering monster list. On a '1' move one blue token one hex. On a '2' move one red toke one hex. On a '3' move one green token one hex. On a '6' a wandering monster rolled up on the WMT appears in the hex the players are currently in. Alternatively, a 1-3 indicates how many tokens to move one hex. Regardless, which token to move and where is entirely up to the whim of the Referee. For example, in the middle of the second row there are a blue and green token in the same room. I would most likely move those closer to each other at the first opportunity. This leads us to one of the more interesting facets of this idea: when two tokens of different factions end up in the same hex, they get to fight. This leads to a noise encounter that the PCs get to investigate or ignore at their leisure. In the meantime, one your tokens comes off the board and you make a note about bodies being strewn about the floor. Here is the part I personally like best: when the PCs enter a hex with a token or tokens, they get to have a monster encounter. At this point one of the 15 monster encounters can be randomly assigned to that token. In other words, every monster encounter is as much a surprise for you as it is for your players. If the players prevail, that encounter is marked off the list and the token is removed. 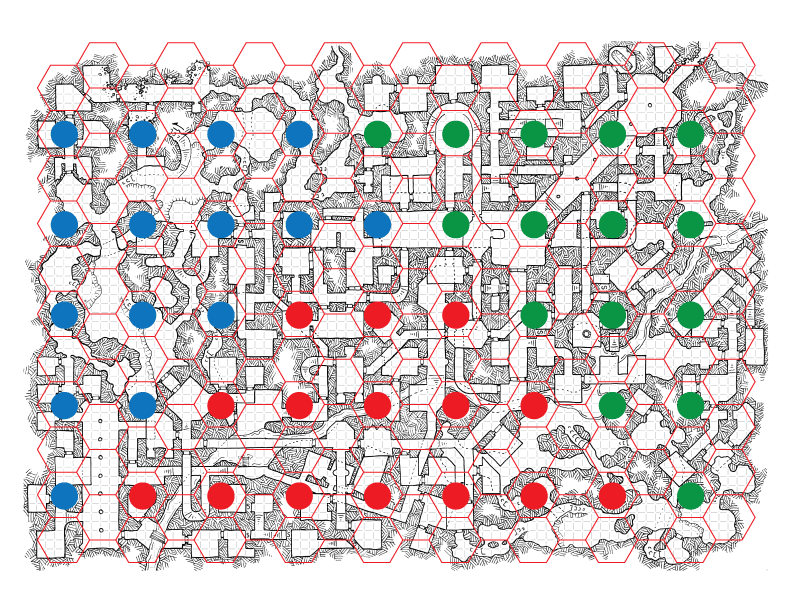 Once the players have wrecked havoc, you have a very tangible and tactile way to restock the dungeon: place new tokens according to the way the dungeon currently looks. New factions can suddenly make their move to gain territory or one faction can bolster their territory as they have been left unscathed by the activity of your PCs. Or whatever. While this may seem to be a bit of a headache at the table, I don't believe it to be overly complicated and it incentivizes wandering monster checks, something I know I am guilty of not doing enough (partly because nothing happens most of the time). Using this idea, something happens most of the time, even if the PCs are unawares. What really attracts me to this idea, however, is the level of danger that gets placed on every wandering monster check. 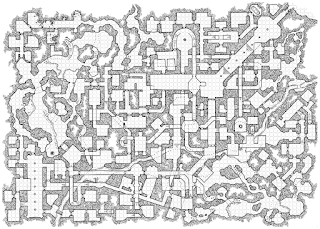 Not only could a monster get spawned from the WMT, but one of the regular monster encounters of the dungeon could come investigating the noise being made by the fighter trying to open that locked door. Nice one! I really love this.